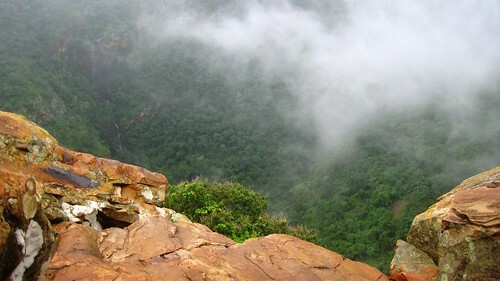 Continuing from where I left off in the last post on Ahobilam, we left from Prahlad Betika much refreshed having enjoyed the shower in the falls, music and some snacks. 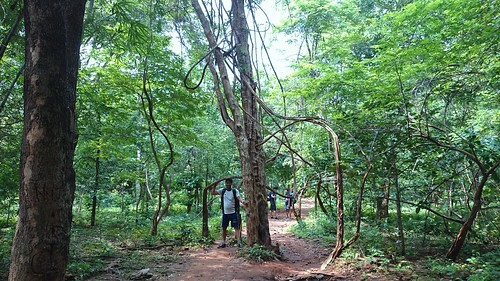 A small trail then led through the Nallamala Forest, going up some times and going down some other. We walked through the waterfalls at times, for that was the only way! Humble and religious faces greeted us at several occasions and we obliged back. One can imagine how deep seated the faith was that this tough walk and trek on the forest-y wild trail full of stones was being done barefoot by ladies, not just young but old alike, and not one but many. We got pumped up as well and decided to follow suit. But, believe me if you will, it would have hardly been 3kms, when we resigned. It was not just tough but very tough. Post that, we saluted the spirit of every lady whom we came across doing that journey barefoot. We reached Jawala Narsimha temple where it is believed that Lord Narsimha finished off Hiranyakashipu. 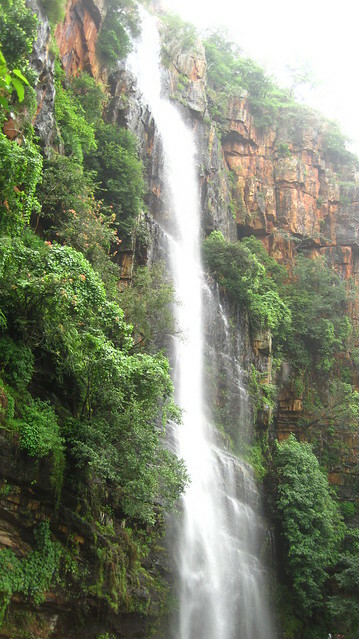 One passes through a super tall waterfall to reach this temple, and it was just unbelievable for us to realize that a waterfall so huge and a place this scenic existed in Andhra Pradesh. Ahobilam is a highly underrated place in AP, we realized. Next up was Ugra Stambham. We located the source of the said waterfall high up and observed a flag on top of the mountain. 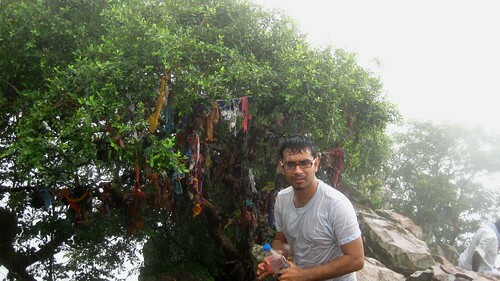 That was Ugra Stambha, on a strenuous and steep trek of 3kms up the mountain! Gopal had given up for the first time and that served us well as we could now leave all our luggage at his disposal for the trek. The Chak De India theme was playing in my head as were adorning our shoes for the first time and preparing for what lay ahead (a lot was hyped as well to us but a lot was still true). With one water bottle, my camera and a biscuit packet, we started climbing. Many boulders were loose, and slippery, and steep to climb. 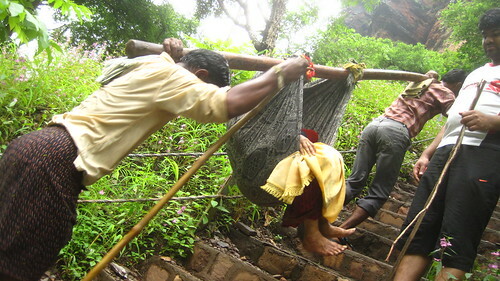 But when we saw ladies coming down from the trek, again barefoot, our confidence was much elevated. We had company of a dog throughout the trek, they always come out of somewhere in such places, right? 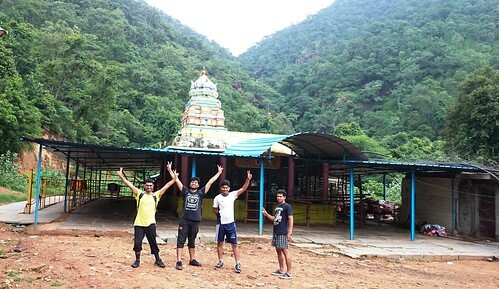 Also, when the trek became tough the mantra some fellow travellers were singing – Om Namo Narayanah clicked with us as well. Once on top… we were speechless! 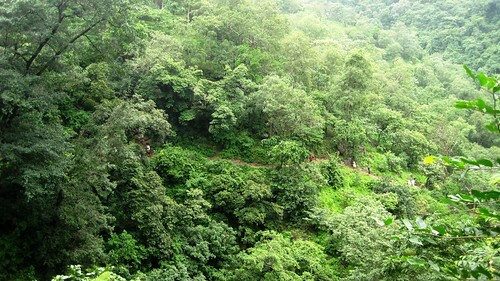 The view was amazing, everything was below us and the view of dense Nallamala Forest lay before us. It was the only place we had mobile reception in 2 days. Walking on the top almost near the edges gave us all goosebumps. 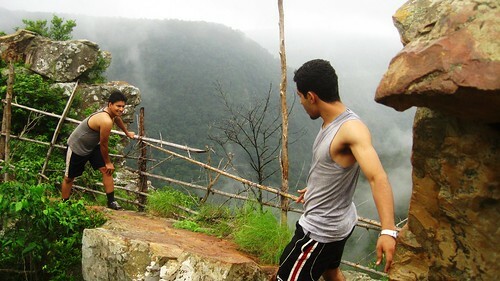 To top to the risky affair that it already was, rains poured just when we were on the top. The flag is on a very small square shaped rocky platform and if you do the parikrama around it, be sure to not look down! We came down finally and narrated the whole scenery to Gopal at least 5 times over. It was time to do the inventory check and Arka’s phrase ‘Reality hits you hard bro!‘, which he repeated during the whole trip really hit us hard. Our water supplies were reduced to minimal. Improvisations came along then and we filled water from that waterfall. 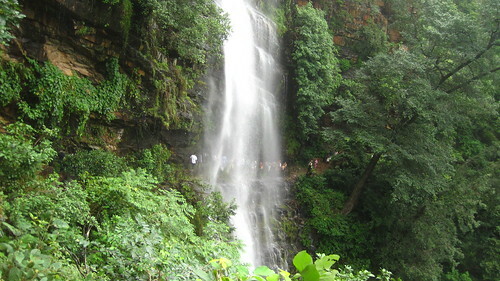 And after that, we were drinking water from the waterfalls only for that day and the next. The sun was going down and it was time to find a place to camp. Quickly. We came back to Malola temple where we had observed some flat ground and a flowing water source. The night we camped in the Nallamala Forest in Ahobilam was one happening night, full of ghost stories and raw Maggi eating, and shivering and cards and fireflies and pupppies and FEAR! I had to write separately about that night. Read it here. We were up in the morning at 5 with the sound of the rooster. We packed up, performed our duties and left just when the first set of pilgrims was coming up. Next came another waterfalls and another opportunity to bath and all! Another wild trail awaited us post that. 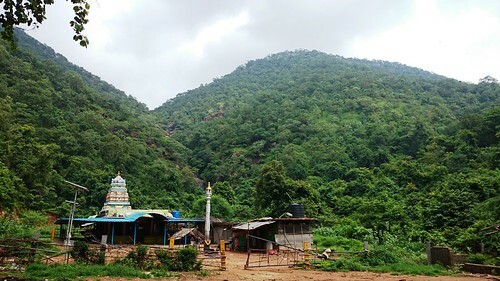 Paavana Narsimha temple is 7kms one way of a wild trail through the deep forest, of which the first 1 km is 800 steps (only). 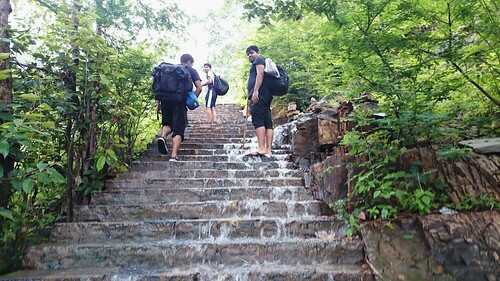 Climbing those stairs while the water ran down them was…wow! The next time reality hit us was when the inventory check resulted very less food at our end while we had to still come back the 7 kms through the wild! Reaching that temple, my friends crashed while I went to inquire for food, a faint hope, if at all. I had just asked a guy about the (probable) kitchen where the food for the temple staff was made when one of the lady pilgrims heard us, and gave me a pack of biscuit. What followed next, left me baffled, humbled and overloaded with food. A lot of pilgrims and travelers sleeping nearby in the temple courtyard woke up one by one and there was a commotion to provide me with food. So many biscuit and bhujia packets and dry fruits I had received that I had to say No after a while. It was incredible. Having stuffed ourselves, we could register the beauty of this temple. Surrounded on all sides by deep forest, Paavana Narsimha sits here with his consort Lakshmi. There is also a motorable road from Lower Ahobilam to here but I think it’s mostly blocked due to slush and rains. After this, we went through the forest again back to the Upper Ahobilam, enjoyed one more dip in the waterfalls and visited the Lower Ahobilam temples (Yogananda Narasimha, Chatravata Narasimha, and Bhargava Narasimha temples) by an Auto as the roads are motorable. The feeling of covering a distance without walking ourselves was soothing! -Like my page on Facebook. This trip had all the ingredients for an awesome trip! 🙂 Yeah, the religious value of this place is very high, so these services are good to have the old ones. 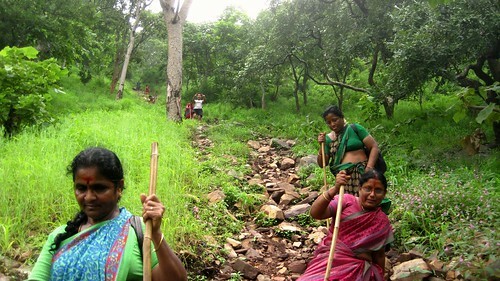 We also saw walking sticks being provided…! It was enjoyable reading your post. Nice photographs ! 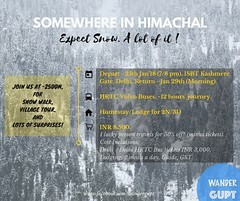 Interesting journey! A good read for me.